Previous research studied the impact that accommodation online reviews have on those reading them. However, this is mainly quantitative and lacks of conceptual frameworks to ensure consistency. Additionally, only a few of these have considered influencing variables (i.e. characteristics of the review and the reader, and surrounding circumstances). This study will focus on online reviews about accommodation establishments. Its aim is to gain an understanding of the value of reading accommodation online reviews, through a qualitative study. A conceptual framework, based on consumer-perceived value theory, has been developed and face-to-face interviews with readers of accommodation online review have been undertaken. The results suggest that the value of reviews is primarily epistemic (fulfilling the curiosity of those reading them) and conditional (depending on the circumstances), as well as partially functional (related to the provision of effective and efficient information to support decision-making). However, limited emotional (i.e. fun) and social value (i.e. providing a feeling of belonging) have been reported. Furthermore, the elements eliciting the different value dimensions and variables influencing these (such as information search patterns) were identified. 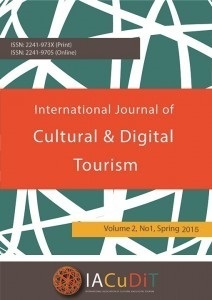 Based on a literature review in academic journals, this paper examines the usage and benefits of web-based applications in cultural tourism for making cultural heritage accessible. A total of 17 research papers addressing this topic were identified. The analysis of the available research suggests that the use of web-based applications helps to make cultural heritage more accessible for different visitors segments. Applications such as online travel planners, mobile tour guide systems, or review portals support the consumer’s experience before, during or after the visit. Additionally, mobile and 3D applications help to make complex cultural phenomena more easily understandable for user and allow entertainment-oriented learning. However, the respective research in cultural tourism is still at the very beginning. Based on the findings, we identify research gaps regarding, for example, the considerable concentration of literature on specific applications and travelling stages of a visit. Our paper concludes with recommendations for future research. The aim of this study is to examine the use of web resources with a view to tracing the discursive strategies enacted to restore the image of a tourist destination. We focus, in particular, on the case of Monterosso which, along with other parts of Cinque Terre, Italy, was hit by a flood in 2011. The innovative aspect of this paper consists in its twofold approach: a linguistic approach within the framework of Discourse Analysis, and a sentiment analysis approach realized through tools available on the Internet and specific procedures we have developed in the R environment. The findings are interesting and encourage to refine our approach in the future. One of the main concerns for museums in the current digital environment is understanding their actual purposes and goals, before assuming a given strategic posture. Consumer expectations are rapidly shifting, from what used to be a passive relationship with exhibition contents, towards a different one, in which interaction, individuality and proactivity define the visitor experience. The underlying issue this paper tries to address is how archaeological museums perceive their current and future role in digital communication. The paper focuses on the importance of heritage, and specifically on the trails that have a significant heritage connotation, and at the same time can serve as the setting of events that are addressed to amateur long run athletes. It explores the intrinsic relationship that connects the heritage trail with the running event, and the role of key stakeholders involved in the conceptualization and realization of such events. A gap in the literature was identified, in the way such events are recorded, processed and evaluated on such variables as impacts for the local community, burden on heritage, motivation on athletes etc. A platform for recording, processing and disseminating information is suggested to be created, so that it can act as a “book of knowledge” where best practices, lessons learned, identification of opportunities can be shared. The paper has particular value for Greece, as it is a country in which heritage trails are in abundance, while running events on heritage trails are organized, but there has been scant effort to track their influence on the amateur athletes.